Anyway... although I love any biscuit pretty much, and I usually make rolled and cut out classic 3-ingredient biscuits, sometimes I make others, including these baking powder biscuits. I prefer cold, cubed butter for these, and although they are hand-formed biscuits, I cut the fat in using a pastry cutter, rather than risk warming the butter too much with my hands. Buttermilk is preferred over sweet milk in this recipe as well, but make that real buttermilk folks, not soured sweet milk! There really is a difference when it comes to biscuits. This is a good place to remind you that, at least until you make enough biscuits to get a feel for flour and liquid ratios, when baking, it's best not to scoop your measuring cup into a bag or canister of flour to measure. Rather, first aerate the flour before measuring, then spoon it into the measuring cup and level it off. If you’re scooping instead of spooning, you are packing the flour and using too much, resulting in a dense, heavy biscuit. I also have been using my Cooper Chef rimmed baking sheet that comes with the crisper basket, to bake biscuits lately. I like the Copper Chef pan because it reacts a bit like a cast iron skillet, giving a well-browned, crunchy bottom to your biscuits. 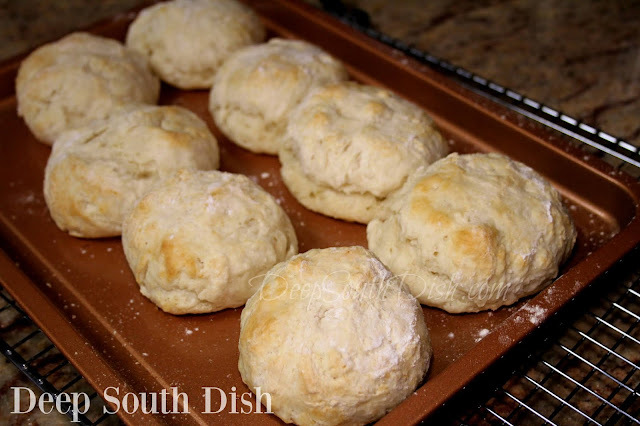 This recipe will make about 8 generously sized biscuits, more if you shape them smaller. Let's get on with making some! Preheat oven to 400 degrees F. If you're not using a non-stick pan, lightly grease an 11 x 9 inch baking pan. Whisk together the flour, baking powder, baking soda and salt. Cube butter and use a pastry blender to cut into flour, leaving pea sized crumbles. Make a well in the center of flour and add 1/2 cup of the buttermilk. Stir until dough is shaggy, then add remaining buttermilk and continuing gently stirring until dough leaves the sides of the bowl and gathers together. Flour hands and pinch off biscuit sized balls of the dough. Quickly roll into a ball and place on tray. Continuing pinching and rolling until all of the dough is used up, flouring hands occasionally. Use knuckles to flatten dough balls. Bake about 16 to 18 minutes, or until golden brown on top. Brush with melted butter if desired. Tender and delicious! Preheat oven to 400 degrees F. If you're not using a non-stick pan, lightly grease an 11 x 9 inch baking pan. Whisk together the flour, baking powder, baking soda and salt. Cube butter and use a pastry blender to cut into flour, leaving pea sized crumbles. Make a well in the center of flour and add 1/2 cup of the buttermilk. Stir until dough is shaggy, then add remaining buttermilk and continuing gently stirring until dough leaves the sides of the bowl and gathers together. Bake about 16 to 18 minutes, or until golden brown on top. Brush with melted butter if desired. 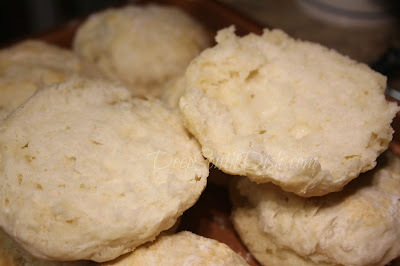 Cook's Notes: I used Gold Medal brand all-purpose flour for the batch of biscuits pictured. I love bacon cheddar biscuits. If I use this recipe, should I make any changes? Haven't used any add-ins with this recipe as written, so can't say how much to use or how that would affect the ratios. If I do that, I'll sure add it to the cook's notes! In the meantime, I do have a rolled and cut ham and cheese biscuit recipe here, if you want to experiment. It's actually a little different, but you can see what I did and the step by step photos along the way.